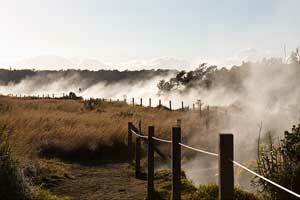 Just after leaving Kilauea Visitor Center, .8 mile ahead on the left is Steam Vents. 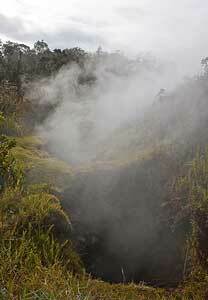 Ground water seeps down to the hot volcanic rocks in this area and returns to the surface as steam. A short way further on is Steaming Bluff located on the caldera's edge. The area inbetween is a grassy meadow with ground cracks and steaming concentrated in fractures along the caldera's edge. 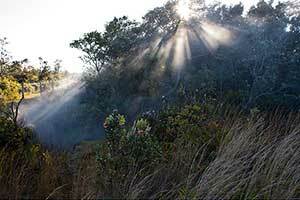 In ancient times the steaming bluff was called `Akanikolea (Cry of the plover). Kamapua`a, a deity of cloud, rain, forest and numerous other body forms, is said to have stood on this cliff while offering his love to Pele, the woman of fire. Pele replied to Kamapua`a's calls with insults. He was so enraged that he started to fight with Pele. 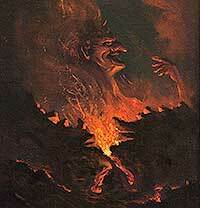 The battle of fire, forest and rain lasted for a great length of time until the two deities were weakened. Kamapua`a only saved himself from the last bit of Pele's fire by taking an Ama`uma`u (Sadleria) fern body and surrounding Kilauea. This is also why Pele's home, the pit crater on the floor of Kilauea is called "Halema`uma`u" (House surrounded by the Ama`uma`u fern). It is wise for visitors to stay on marked trails. On March 30, 2001, a visiting geology student from Oregon fell about 12 m (40 feet) into a crack in the ground between Crater Rim Drive and the rim of Kilauea's caldera, opposite Kilauea Military Camp. He and a companion had seen a dark area free of vegetation. Lacking a flashlight, they couldn't tell what it was. After some discussion, they went for it. The man fell. The young woman stopped in time, hurried back to the road, left a slipper to mark the location, and ran screaming to KMC for help. Paramedics quickly responded and worked with a rescue team from the national park and Hawai`i County to pull the man to safety. He had ended up on a narrow ledge, which kept him from falling much farther, and luckily escaped with minor though numerous contusions. Encounters with cracks in the summit area of Kilauea are not new. Two members of Ellis` exploring party fell into cracks on Steaming Flat near Sulphur Bank on August 1, 1823, though fortunately none was badly injured. They had more of an excuse than do most later victims, however. Many cracks were then covered by a thin veneer of volcanic ash erupted in and before 1790. Now more of the cracks are open and obvious, because the veneer has washed away. Most of the cracks and vents in the summit area result from the collapse of the caldera in the late 15th century. They formed when the caldera dropped down and the walls of the new depression moved slightly toward the empty space. Similar kinds of cracks develop behind blasted quarry faces. Some of the cracks are actually small faults that formed during the collapse of the caldera. They can be recognized by vertical offset, the side nearest the caldera being a little lower than the other side. Other cracks form during landslides or rockfalls into the caldera. The 1983 Ka`oiki earthquake caused large rock slides that peeled away from the northeast side of the caldera, damaging Crater Rim Drive beyond repair. The Earthquake Trail, starting near Volcano House, now takes visitors along the old pavement to the site of the slides, where hikers can note gaping cracks cutting the pavement. All of these cracks are more or less concentric to the caldera. Their consistent pattern, paralleling the wall of the caldera, helps to recognize them and to anticipate where one can step safely to avoid them. Away from the high ground, some cracks on the caldera floor are also concentric. Most are near Halemaumau and formed during the 1924 collapse of the crater or during later rock falls. Many of these cracks are very dangerous and are to be avoided at all cost. Other cracks on the floor are straight, not curved, and are related to eruptions. Most of these cracks trend a little north of due east. Several can be seen northeast of Halemaumau, in the area of eruptions in 1954, 1971, and 1982. Still other cracks on the caldera floor are related to the collapse of the caldera itself. Some of these cracks have been reactivated from time to time. A good example is the crack that crosses the road just beyond the southeast end of the Halemaumau parking lot. It reopened in 1924, though its trend shows it to be a caldera fault that formed much earlier. Cracks are common in the summit area of Kilauea. Many visitors are surprised by them. The crack hazards are easily avoided. Stay on trails, don't walk after dark without a flashlight, and don't wander around outdoors if you're under the influence.